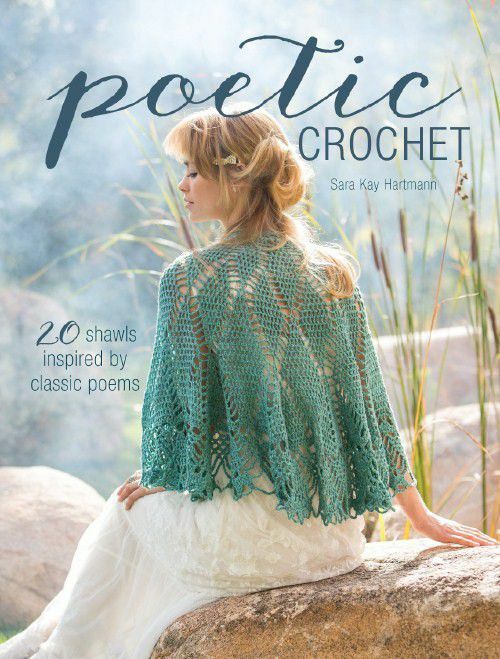 Sara Kay Hartman has come up with a beautifully creative idea for her crochet book Poetic Crochet. In this book, she shares twenty crochet shawl patterns. What is innovative is that each and every crochet shawl in the book is inspired by a classic poem. This infuses the book with inspiration, bringing us designs that are filled with feeling. In his book The Zen of Creativity: Cultivating Your Artistic Life, zen master John Daido Loori explains that at the heart of true creativity is a process through which the artist has worked diligently, peacefully, fully to understand the intricate essence of the item that inspires the work. So, for example, when you take a photograph of a sunset, you honor the sunset, wait for the right time to take the photo, practice a form of working meditation that allows you to innately understand the inherent qualities of all sunsets and what makes this sunset unique from all of those. By going through this process, you are able to capture the sunset in a way that no one else ever has or will. This is art. I share this story about the Zen of Creativity because it comes to mind immediately as I look through Poetic Crochet. Each crochet shawl pattern in this book was inspired by poetry, and each shawl seems to emanate the essence of the poem that was studied to produce the work. I get the feeling as I look at these crochet patterns that there was no rushing through the design process here, but rather that there was a true study of the nature of a poem that was then carefully translated into the crochet shawl pattern that is paired with that piece of poetry. It's amazing, and it's what sets this collection of 20 crochet shawl patterns apart from other curated sets of crochet shawl patterns. Some of the patterns share a line of the poem that inspired the piece, others share a bit of an introduction about the creation. We don't get the full poems here, but that works, because if something inspires you in the crochet shawl, it can inspire you to track down the source. There is poetry in this entire process. Each of the crochet shawl patterns in this book are designed for an advanced beginner. Many of them have the romantic feeling of old lace but they are worked with contemporary yarn, using modern, easy stitch patterns, so that they can be crocheted by people who don't want to fiddle with classic lace. With two exceptions, these crochet shawl patterns are worked in single, solid colors. The beauty is in the stitch patterns, which are pleasant to work and a pleasure to wear. There are a wide range of different crochet shawl styles here, and yet they all feel like they could go together in a collection, walking down the same runway at fashion week or hanging in the same section of a boutique store. I find the act of crocheting poetic because it is beautiful, creative, and soulful. Despite our technology-driven world, we do not have crochet machines (other than our fingers). Therefore, we must take time to form one stitch after another in work that is beautiful and meaningful."